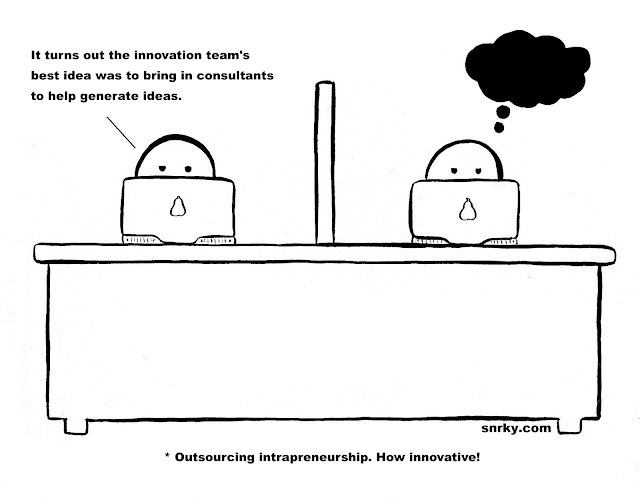 Snrky: Outsourcing intrapreneurship. How innovative! I was being facetious here, but as noted in this HBR blog post it turns out that companies routinely pour a lot of cash into the innovation outsourcing business. I have to wonder, however, what impact this might have on the morale of the internal 'innovators' who hoped to come up with the next big thing. Title: Outsourcing intrapreneurship. How innovative! Snarky: It turns out the innovation team's best idea was to bring in consultants to help generate ideas. It most of the rural schools the teacher student ration in too low (5 classes: 2 teachers). Merely introducing common syllabus we can't expect uniform education development in all schools. The state Government should came forward to allocate more finance to the education development. Green Essay discounts can help us to prepare our term papers with responsible cost. Research papers writing with Ultius.com coupon codes that is essay and reliable for the students.